Appraiser Gus Agosto gave a lecture on “Real Estate Appraisal Practice” at the Trinity University of Asia (TUA), located along E. Rodriquez Sr. Avenue, Quezon City, last April 7, 2018. Prof. Gus discusses the steps in conducting appraisal, using the sales comparison and cost approach in valuation. The lecture was followed by an actual appraisal and group reporting. 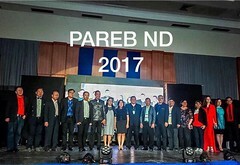 As the Vice-President of Philippine Association of Real Estate Board (PAREB), he has conducted lectures and mentoring on appraisal with different local board. He conducted a series of seminar in Cebu and at the PAREB Center in Pasig City. As faculty member, he also teaches real estate and finance in University of San Carlos in Cebu City. The lecture was organized by Prof. Karen Uy, one of the faculty of the Bachelor of Science in Real Estate Management. He has appraised properties of various type such as power-plant, beach resorts, commercial buildings, hotels, hospitals, schools, residential, memorial parks and others. Appraiser Gus has been appointed several times as appraisal court commissioner in various courts within the country, even in the United States and Australia.